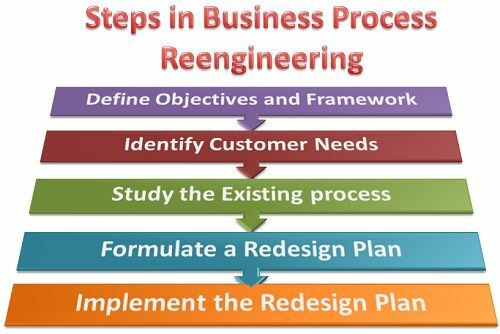 Definition: The Business Process Reengineering is the examination and redesign of business process to achieve the dramatic improvement in its performance, productivity, and quality. Define Objectives and Framework: First of all, the objective of re-engineering must be defined in the quantitative and qualitative terms. The objectives are the end results that the management desires after the reengineering. Once the objectives are defined, the need for change should be well communicated to the employees because, the success of BPR depends on the readiness of the employees to accept the change. Type of Customer and customer groups. Customer requirements, buying habits and consuming tendencies. Customer problems and expectations about the product or service. Study the Existing Process: Before deciding on the changes to be made in the existing business process, one must analyze it carefully. The existing process provides a base for the new process and hence “what” and “why” of the new process can be well designed by studying the right and wrongs of the existing business plan. Formulate a Redesign Business Plan: Once the existing business process is studied thoroughly, the required changes are written down on a piece of paper and is converted into an ideal re-design process. Here, all the changes are chalked down, and the best among all the alternatives is selected. Implement the Redesign: Finally, the changes are implemented into the redesign plan to achieve the dramatic improvements. It is the responsibility of both the management and the designer to operationalise the new process and gain the support of all. Thus, the business process reengineering is collection of interrelated tasks or activities designed to accomplish the specified outcome. I think these concise and major steps comprise everything needed in a business process optimization initiative. Thank you, Easy to get in short time.